Our culinary program offers hands-on cooking lessons for budding young chefs. We learn more than how to follow a recipe at Lil’ Chef School. We utilize math, science, teamwork, creativity and more. Children learn cuisines of the world and enhance their experience with fruits, vegetables, herbs & spices while gaining confidence and experience in the kitchen that will last them a lifetime. 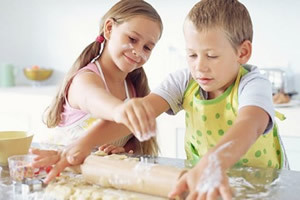 Children will make 2 recipes each week and will get a tasting of the food they made at the end of class. Recipes are provided online. Price includes all materials, recipes and food tasting. This class may use charter funds from Sky Mountain Charter School, iLead, Excel, Sage Oak, Springs, Inspire, National University Academy, Shield, Compass Charter Schools, Summit Academy, Epic Charter, Peak Prep Academy and Valiant Academy. Our classes are drop off only- we find parents and younger siblings are a distraction to our young Chefs who are participating. If your child cannot sit and take directions then they may be too young for our class. Customers using Charter Funds: There are NO make up classes or refunds.